Home | Dogs | Pest control treatments | Bedbug Bed Bug Natural Killer, Bedbugs known as "THE LITTLEST VAMPIRES".© $ave now | Bed Bug Patrol Pen Size Sprayer is 100% Natural bug killer, Single Bed Bug Travel & Luggage Spray Pen Size Sprayer Price includes (free shipping). Home | Horses | Pest control treatments | Bedbug Bed Bug Natural Killer, Bedbugs known as "THE LITTLEST VAMPIRES".© $ave now | Bed Bug Patrol Pen Size Sprayer is 100% Natural bug killer, Single Bed Bug Travel & Luggage Spray Pen Size Sprayer Price includes (free shipping). Home | Cats | Pest control treatments | Bedbug Bed Bug Natural Killer, Bedbugs known as "THE LITTLEST VAMPIRES".© $ave now | Bed Bug Patrol Pen Size Sprayer is 100% Natural bug killer, Single Bed Bug Travel & Luggage Spray Pen Size Sprayer Price includes (free shipping). 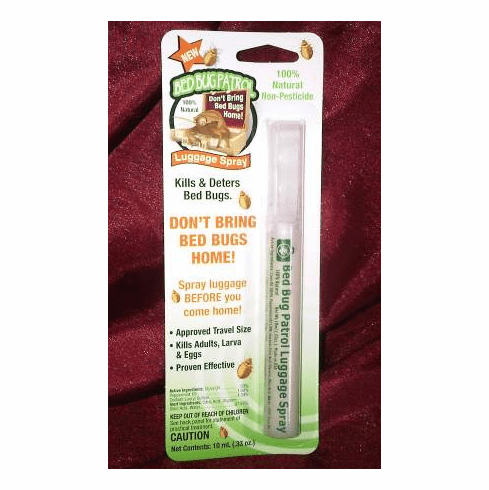 Home | Bedbug Bed Bug Natural Killer, Bedbugs known as "THE LITTLEST VAMPIRES".© $ave now | Bed Bug Patrol Pen Size Sprayer is 100% Natural bug killer, Single Bed Bug Travel & Luggage Spray Pen Size Sprayer Price includes (free shipping). Bed Bug Patrol Pen Size Sprayer is 100% Natural bug killer, Single Bed Bug Travel & Luggage Spray Pen Size Sprayer Price includes (free shipping). Bed Bug Patrol is 100% Natural bug killer, proven to eliminate Bed Bugs (Cimex lectularius), without harsh pesticides found in many traditional treatment methods. Most Bed Bug treatment products use Permethrins and Pyrethrins, which are serious carcinogens and pesticides. To learn more about Permethrins from Cornell University go to CornellUniversity.edu. Our Price includes free shipping. Bed Bug Patrol has been helping people overcome bed bug infestations for years and has the experience to help you with your treatment. After spending years of research on safe treatments for bed bugs, Bed Bug Patrol has developed an exclusive formula not found in any other product. Fossil Shell Dust® is for long term bed bug protection. Fossil Shell Dust is a natural, non-toxic, 100% safe substance made up from crushed fossils shells of freshwater organisms and marine life. Crushed to a fine powder when seen through a microscope, the particles resemble bits of snowflakes through the lens. Harmful to any insect and completely harmless to humans, animals, fish, fowl or food. Insects have a waxy outer shell covering their bodies, Fossil Shell Dust cuts through this shell causing the bed bug to dehydrate and die. Fossil Shell Dust's mode of action is strictly mechanical. Bed bugs can not build immunities to this method of pest control such as traditional pesticides. The microscopically sharp edges contact the bed bug or parasite, and pierce their protective coating, causing them to dehydrate and die. The larvae is affected in the same way. This makes Fossil Shell Dust an excellent and totally natural pest control and can be used as a dust for many other external pests as well such as fleas, spiders, mites etc. BED BUG 1-2 PUNCH 1 - Spray all surfaces with Bed Bug Patrol for Immediate Kill 2- Dust with Fossil Shell Dust for Long Term Protection No more endless itching so bad that it’s driving you crazy! No more sores from where you’ve been attacked bed bugs! No more anxiety & sleeplessness that have plagued you!